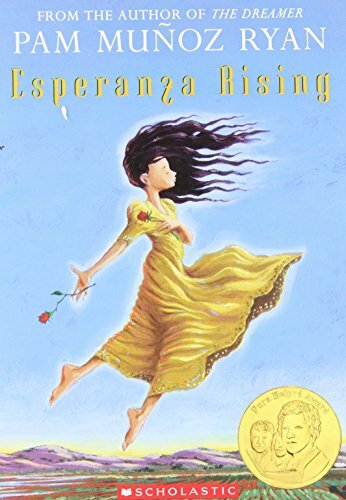 Esperanza Rising is a moving story about a migrant worker during the Great Depression. Itopens a world seldom seen with authenticity, and without seeming politically motivated. Real, not a soapbox. The actual writing I found slightly uneven. The foreshadowing was blunt and obvious especially at the beginning where emotions were “told.” Plus an emotional connection to the characters was assumed but without the groundwork having been done to create it. Maybe the author is so horrified by suffering that she couldn’t put her characters through it, so wrote it in this emotionally distant way? I don’t know. At other times the language was rich with metaphor, “monstrous lions’ paws resting at the edge of the ridge” (94). A major plus and point to applaud: Esperanza’s character change is subtle and deftly done—gradual and shown through actions rather than narration. A Beautiful book.